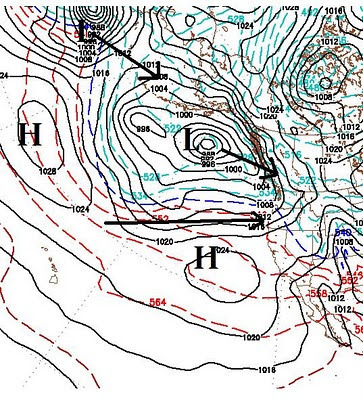 High pressure off the California coast will be joined by another high pressure system. The two systems, which will form one bigger system, will actually shift slightly north and block any type of weather activity from Tahoe. In addition, warm and very mild air will accompany the blocking systems, pushing temps in the leeward valleys into the 70's by Thursday. As the storms come ashore well north of our area, we will get some wrap around affect, but that will be mostly wind and slightly cooler temps. Although this storm is the weakest of the bunch, look for 1-2 feet above 7,000 by tomorrow night. Ridge City follows with mild temps and plenty of sunshine. Squaw Valley has reported 220 inches of snow (19 feet) in the month of March and 55 feet for the season. I guess the next time people hear of La Nina, they will think snow. GFS has this ridge entrenched for at least 10 days with little or no movement. Bottom line, enjoy the Pow this weekend as the storm cycle appears to be coming to an abrupt halt. As of now it looks like the best days to hit the POW are still Thursday and Saturday. However these storms and a third storm are coming in so close, it could snow right through this weekend. My apologies, but the 3rd and 4th image from the last post were the same. I have placed the correct 4th image on the post. The winds are holding off for now and the storm is slamming us. The lifts are open, get up the mountain! 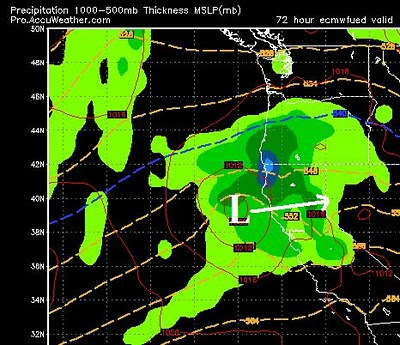 Briefly: Storm moves in late Saturday night, initially hitting north of Tahoe. Picks up steam on Sunday and moves south early Monday morning. Briefly: Weakest storm in the bunch, comes straight from the west. Gets pushed out by bigger storm on Friday. 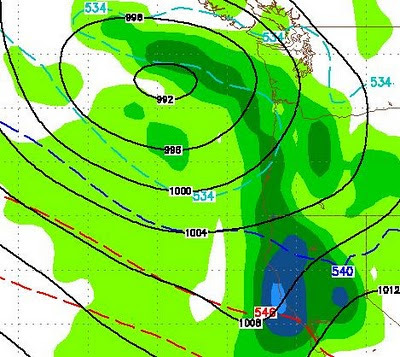 Briefly: Strong storm coming in from north, long wave pummels Tahoe for 3 days. 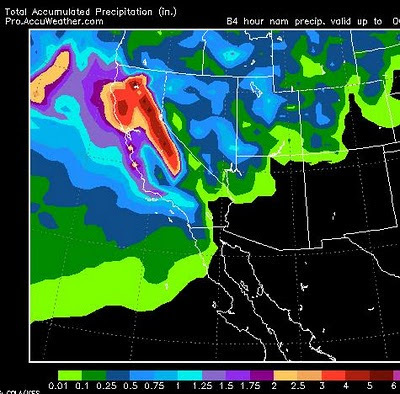 This chart represents liquid precip from two storms that are going to slam our area and most of California. Incidentally this does include the leeward valleys of the Sierra and I would not be surprised if NWS issues a Winter Storm Warning for Reno and Carson. 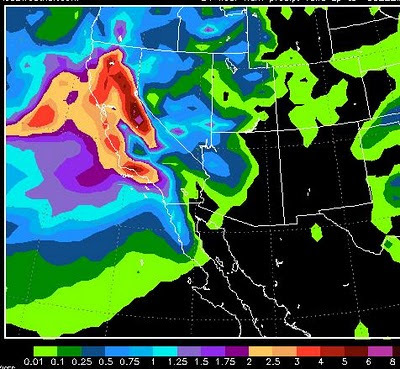 If you live in the foothills, expect heavy snow, perhaps as much as a foot by Tuesday. The timing for our next storm will remain Friday afternoon and evening. This storm will have much colder air to work with, but not nearly as much moisture. Having said that, I look for the Sierra Crest to pick up 1-2 feet of snow. The snow to water ratio will be much higher, in the 15-1 or even 20-1 ratio. For you Slide Mtn enthusiasts, I am looking for 6-18 inches by Saturday morning. This event may only last for a few hours and a blocking wind is in place. There will be some spillover to the valley and it will be all snow. Perhaps an inch or two (in the valley). 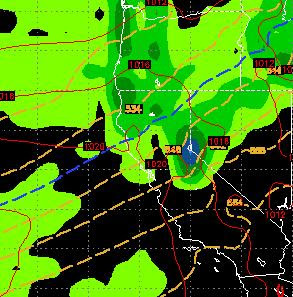 Here is the GFS forecast for late Friday afternoon. I should mention that EC has this storm coming in about 8 hours later than GFS, but the conventional wisdom is that GFS is right on this one. Either way, Saturday morning should be epic with plenty of champagne powder. Last nights storm came in pretty much as predicted and moved the snow total on Slide Mountain to 407 inches and counting. The party is over for now, but starts up again tomorrow afternoon. 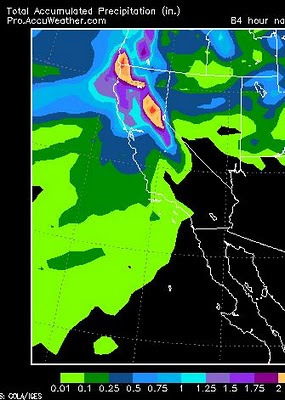 If this thing comes in just right we can look for 18-36 inches of additional accumulation in the upper elevations of the Sierra and Carson Range by Wednesday night. 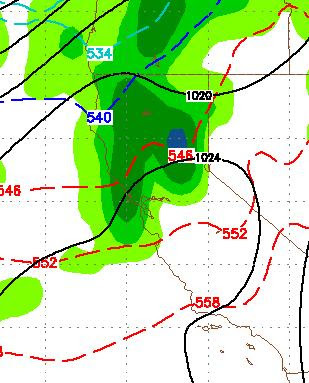 As I said yesterday, this is a warmer system and will probably be mostly rain below 7,500 feet. Of course the base at Mt. Rose Ski Tahoe is over 8,000 feet and therefore this should be all snow. NWS is calling for rising water levels on creeks and streams but does not fear any wide spread flooding as of now. 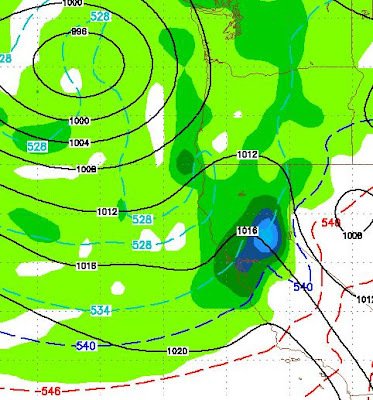 This is a pretty big storm for mid-March and it is tracking south, right through central California. EC is the most aggressive of the weather models for this forecast but all models are pointing toward a very stormy week. 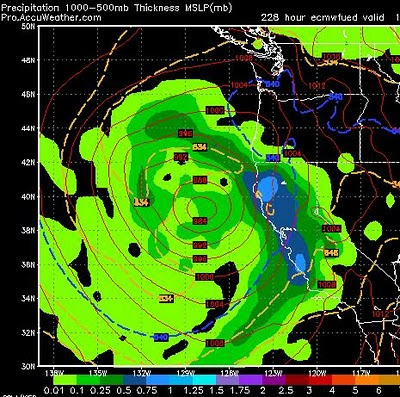 GFS has the party starting late Sunday night and shows mountain snow for the next 5 days with virtually no break. Our ridge to the south has not moved further south, but broken down completely and is reforming to our north which oftentimes means these types of stormy periods. 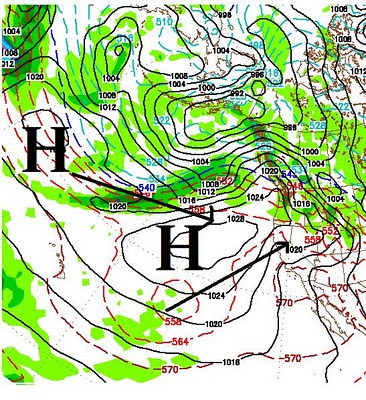 Blocking High Pressure has set up to our south and west. 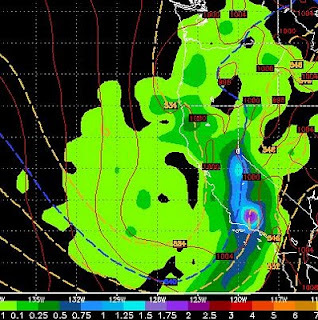 This causes the storms to track north of Tahoe. Currently the models have that blocking high moving slightly south, which puts us right on the edge of the storm track. 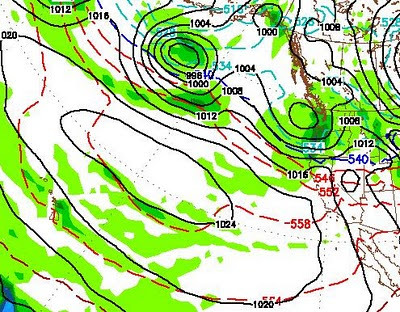 If it moves a little further south than expected, we can expect another storm cycle to start up next week. If it remains or moves only slightly south, we can expect just glancing blows that bring us wind but very little if any precip, which is that typical Sierra spring pattern I talked about last post. The last storm in the cycle has now moved through the area dropping close to a foot of snow on Slide Mountain and leaving slightly more west of the crest. This is exactly what we expected as the models nailed another one. As the backside of this storm drops down the cold front, winds will continue, however by Tuesday afternoon a ridge of high pressure will move into the area bringing sunny skies and much warmer temps. Expect 60's by Wednesday. As you can see, most of the action is on or west of the Crest.